For the longest time I have wondered about Taylor Lautner. I wondered whether once we got past the rippling abs and the screaming girls who lust after Jacob Black from the Twilight franchise (and by default, for Lautner himself) we could find either an actual actor or at least a star within our buff buddy's body. Abduction is his first foray into carrying a film on his own rather broad shoulders. 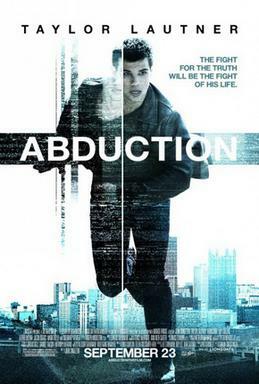 Now, I need wonder no more: not only is Taylor Lautner completely inept as an 'actor', he can't even make something as lousy and stupid as Abduction interesting or even funny. I should note for the record, in case anyone is interested, that it takes about five minutes into Abduction for Lautner to show us what he's good at: being shirtless. I know it's completely idiotic to actually think on how any of that is relevant to the plot of Abduction; it's like what Larry the Cable Guy said about his catchphrase, "Git-R-Done": you gotta hear it at least once in his shows. Likewise, you gotta see Taylor Lautner shirtless at least once since the audience expects it. Nathan (Lautner) is your average teen: getting drunk at parties (hence how he ended up shirtless on the front lawn), looking at the girl across the street, Karen (Lilly Collins) with barely hidden love, and his loving parents Mara and Kevin (Maria Bello and Jason Isaac) just looking on. Nathan has anger issues, which require him to see a psychiatrist, Dr. Bennett (Sigourney Weaver). As luck would have it, Nathan's teacher assigns him Karen as his partner on something about websites. Well, Nathan finds one where the photographs are digitally aged, and one of them looks a lot like him! When he gets in touch with this site, it alerts two groups: the CIA, in particular Agent Burton (Alfred Molina) as well as the creators of this website: a gang of Serbian dealers in state secrets, headed by the nefarious Kozlow (Michael Nyqvist). The website itself was a ruse to get Nathan's attention, and now Kozlow's agents are after him. Needless to say, as part of their plan, they off Mara and Kevin who were Nathan's 'guardians', watching him in place of his real father, a super-agent. In a real humdinger of a twist, Dr. Bennett herself is another 'guardian', while poor Karen gets caught up in all the mayhem. Nathan & Karen get directions which lead them to Pittsburgh, a final confrontation with Kozlow, and the faint appearance of Nathan's father. Would it be fair to say that Abduction is an absolute mess? I truly wonder whether Shawn Christensen's script was meant to be a parody of action/thrillers. So many things in Abduction make no sense, starting with the title itself. If we believe the story, Nathan was not technically abducted by anyone. Mara, Kevin, Dr. Bennett, and Bolton all knew Nathan's parents, and after Kozlow offed Mamma, the first two took him in. For the rest of the movie, Nathan was chased by people, but no one ever actually abducted him No one else is abducted, with only poor Karen being the closest person in the entire film who can claim to have been taken against her will. Another point of contention with Abduction is the lengths Kozlow and his henchmen go to find Jacob...I mean, Nathan. We're really suppose to believe that he set up a series of missing persons websites knowing that Nathan would eventually stumble across one of his and discover his parents weren't his parents? The phrases 'far-fetched' and 'highly implausible' come to mind. I haven't even thrown in the bit about Nathan's dreams being suppressed memories of when he was just a baby, or how everyone can track him down with the greatest of ease, or the bomb in the oven. No, let's tackle that 'bomb in the oven' bit. When Kozlow's hitmen find Mara and Kevin, Nathan comes across his mother being murdered, then he and Karen see Kevin knocked off. In all this, one of the hitmen had time to plant a bomb in the oven? Not only that, but he preset it within seconds of him revealing this bit of info and thus, giving our heroes scant time to escape? I know we're suppose to have some suspension of disbelief, but the story becomes more and more ludicrous, idiotic, and downright silly to take seriously let alone plausible. If could keep piling on more and more laughable moments, you pretty soon won't take anything seriously. Topping off just how lousy the script of Abduction is, we have something that is completely irresponsible in any movie: repetitive exposition dialogue. We see the house blown up (see "bomb in the oven") after Nathan's parents have been murdered in front of his eyes. When the call Nathan was making to 911 is taken over by Burton, Nathan tells him, "I just saw my parents murdered before my eyes; how do you think I am?" The dialogue was bad, but Lautner's staccato and dead delivery only heighten just how awful it is but more on that later. For myself, the moment when Burton catches up with Nathan and Karen is the highlight of laughable and painful moments of the Cinema of 2011. "Why don't I buy you a burger and milkshake?" he tells them, and I freely confess I burst out laughing at such awful dialogue. If all that weren't bad enough, Taylor Lautner either decided or was directed to channel William Shatner at his worst. "Whose idea...was it...to put me in foster care...or whatever you want to call it?" he tells Burton, over a burger and milkshake, mind you. As I saw the scene and heard Lautner deliver his dialogue, I truly wondered why he decided to do his imitation of a Captain Kirk from Star Trek line reading. I should note that the ellipses are all pauses Nathan takes while saying this one line. For all the build-up Lautner has been given as the next great star, he truly is either the worst actor working today or he decided to not even try here. Throughout Abduction, his delivery was one-note: that of someone who was repeating words given to him. There was never a drop of emotion from Nathan, as if nothing ever registered with him: not the killing of his parents, not the recurring dreams, not the discovery of him not being Kevin and Mara's natural child, not facing off against Burton or Kozlow. If he had been trying to be the Terminator, it might have worked because Taylor Lautner was robotic as Nathan. Actually, I think a robot expresses more emotion than Lautner did in Abduction. Even if the dialogue had been as witty and clever and on the same level as All About Eve, Lautner somehow manages to screw up even the most basic reactions. At one point, he's suppose to push himself away from the image on the screen which he knows to be him. His face expresses nothing except a mad desire to try to act, but it only comes off as funny, as does whenever he tries for anything requiring emotional range, as when he confronts his mother about knowing he's not her child. Of course, his partner in crime, Miss Collins, does not help matters. Maybe she knew Abduction was junk, and a vehicle for Lautner and not her, therefore, she decided not even to try. I truly hope that is the case, because if not, she shows herself dangerously close to Lautner-non-acting level. We also can't forget or perhaps forgive the cavalcade of truly talented performers who found themselves in this maelstrom of a misfire. Weaver has at most three scenes with a character that is both highly implausible and shockingly omniscient (how else to explain how she suddenly knew what hospital to turn up in to spirit our heroes out). Molina had nothing to do but stomp around, barking orders at everyone (even Nathan). Poor Bello and Isaacs had nothing to do in the film that when they are killed off, it almost comes off as a mercy killing. Side note: perhaps the most shocking moment in Abduction is when we find out that Nathan is only 5'9" which makes me wonder if Taylor Lautner is really that short in real life. IMDB has him at 5'10 1/2", so it might be a quibble, but for some reason this detail stuck out at me. (APRIL 2018 UPDATE: IMDB now lists him as 5'8 1/2", which puts Abduction into a little more context in making Nathan's height closer to Lautner's versus before when it appeared to make him shorter). The final nail on the debacle that is Abduction comes from the fact that the director is John Singleton. The youngest and first African-American Best Director nominee apparently has decided not even his talents could get anyone on screen to act. Therefore, he decided to focus on the action aspects of Abduction (the sequence on the train was, granted, good if again not believable). Even here, the entire scene at Pirates Stadium would have you thinking, 'come on, this is flat-out nonsense'. Abduction really asks for far too much from us: in terms on non-acting, non-story, non-sense. In the end, Abduction can be enjoyed, with one proviso: one must be drunk while watching it. That way, one can admire just how pretty Taylor Lautner is without having to try and figure out either what is going on or endure Lautner's lousy "acting". Son, stick with what you're good at. Wow! That was lengthy... sure you didn't like the movie? Please don't tell me you spent money to see it! A.) Yes, my reviews are long (but I'm working to make them shorter). B.) No, I did not like the movie. C.) Yes, I paid to see it. In my defense, I think it was part of a bet.